France, 2004, 94 minutes, Colour. A Ce Soir (Nellie) was co-written and directed by Laure Duthilleul. She had been an actress for over twenty years in many films but mostly for French television. This is her first film as director. The film is a star vehicle for Sophie Marceau, whose films range from D’ Artagnan’s Daughter to many French films as well as international films such as Anna Karenina with Sean Bean, Alex and Emma with Luke Wilson and Kate Hudson as well as being the villain in the James Bond film, The World is Not Enough. This is a film about death. It takes place over four days after the death of a local doctor and is a view of French provincial life viewed by his wife. She looks at herself, the relationship with her husband, children, as well as the people in the town. 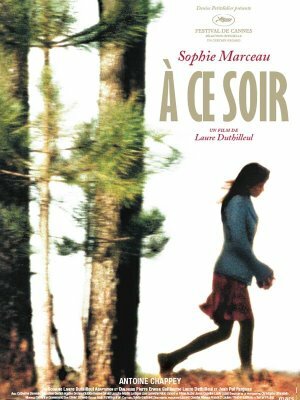 The film is an emotional tour-de-force for Sophie Marceau and it an invitation for an audience to explore the nature of death as well as the experience of grieving. 1. The story of death? Coping with death? Wife, children, brothers and sisters, friends? 2. The town setting, the opening, the walk in the forest, the overview of the town? Small, the streets, the home? The doctor's surgery? The musical score? 3. The woman's perspective on a wife, coping, children, death? 4. The tracking shot in the home, giving the overview of the home, finishing with the dead doctor? Audiences getting to know the house? 5. Nelly, in herself, age, experience, student nurse, the romance with Manuel, the marriage, the children? Her explaining to the sympathetic woman about her life? Her husband stopping loving her? Her infatuation with his brother? Her wanting to talk with him? The shock of his death? Her behaviour, irrational, emotional? Leaving the body there? Her communicating with the children? The mayor? Jose? The difficulty with the undertakers, the interview with the woman, not wanting the undertakers to come? The men deciding to build the coffin? Her irrational outbursts, emotions? With the children, doing her daily work, withdrawing? The discussions? The doctor, the preservation of the body, the friends coming to view the body, the refreshments afterwards? Her going to the river, going in, attempting to drown herself, the rescue, hospital? Her sister-in-law coming, their talking frankly? Her beginning to get over things? The burial? Her future? The clash with Pedro about the camera? Her love, stability? 6. Nelly with her children, getting them up, the day at the beach? Her caring for them, clothes and food? The little girl and her continued playing, crying, being upset? Pedro and his moodiness? Etienne and his being friends with the children, staying in the house, not knowing his parents? Joining in every activity with the family? At the beach, the video camera, running off and playing with the little girl? Their reaction to their father's death? Changes of mood? 7. Jose, his support of his brother, supporting Nelly, in love with her, the building of the coffin, digging the grave, ringing his sister, her coming? The burying of the body? 8. Rene, the mayor, his help, the cemetery full, the digging of the grave? The old man painting the coffin? Their getting it out of the window, its disappearing, coming back? 9. Nelly and her work, the old lady trying to burn the house down, her going to visit her, injections_ her work? The phone calls for her husband, her growing impatience and frustration? 10. A portrait of French provincial life, the human issues of sudden death, the emotional reaction, coping with the practicalities of death, facing the future?